While many kids are comfy eating tuna fish sandwiches for lunch, salmon may be a tougher sell … unless, of course, it’s our lunch-time salmon salad. 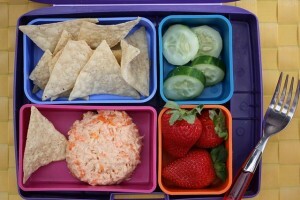 Ideal for wraps or served in a bento-style* lunch box with scoopers, kids will eat it happily and reap the benefits of all the heart-healthy omega-3 fats. SPECIAL OFFER: SchoolFamily.com readers can purchase No Whine With Dinner at 30 percent off the list price, and get free shipping, by ordering the book here and using this promo code: FS2011. *Note: bento refers to a traditional Japanese lunch preparation in which rice, fish, and seaweed are packaged in an attractive lunch box, or "bento box." Bento boxes, like the one pictured in the photo below, are widely available online and at some retail stores. In a medium bowl, place the salmon, carrot, mayonnaise, honey mustard, salt and pepper to taste, and dill (if desired) and stir to combine. Divide the salmon salad between two plastic containers with tight-fitting lids, and place optional "scoopers" in separate containers.